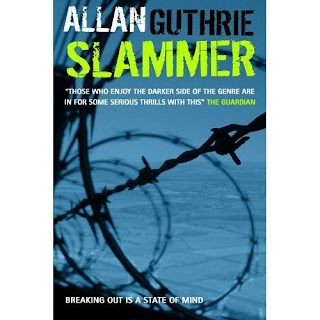 Slammer is a gripping novel by the man behind the fantastic Criminal-E blog and author of the critically acclaimed novels Hard Man and the 2007 Old Peculier Crime novel of the year Two-Way Split. Slammer is now available as a digital download. Slammer continues the theme of some of his other novels, which is that of flawed characters. Allan Guthrie does to his characters what major car manufacturers do to crash test dummies and then some. That’s not to say that they don’t sometimes deserve being put through the mincer. Guthrie delights in bringing us protagonists that for one reason or another are not functioning on all levels. The major character Nick Glass is a weak individual who is easily exploited and most definitely not the kind of person who should be working as a prison officer. Your whole world can shatter if you make the wrong decisions and so it is for Nick Glass, an individual who it is crystal clear has chosen the wrong career. When Glass turns to drugs for solace his life starts to go downhill rapidly. A very fast paced novel that is most definitely for adults only featuring graphically described dark scenes. However, I’d point out that they are in keeping with the setting and never overdone. Slammer is a gritty psychological thriller, which as you come to expect from Guthrie is the kind of tightly written novel you race through. A roller coaster ride of a novel and like any good roller coaster you are thrown around with all the twists and turns. Allan Guthrie remains tartan noirs master of the nasty surprise. His plots are never predictable which is one of the things that make his novels such a thrilling read. Cracking stuff with Guthrie at the height of his writing prowess. Allan takes you to places you never thought existed, then he tells you they don't, then you tell him they do. Then he says they might, then you say they can't. If that sounds like Mr. Guthrie is playing ping pong in your head, you're right . . . but you're not. Oh heck read the book you'll know what I mean . . . or you won't. Brilliant, simply brilliant -- and that's a FACT, Jack. Great review! This book rocks.